When looking at the Game Details page of one of your games, underneath the game's title is a button labeled Settings (it's the one directly right of the Looking for Players button). Clicking on this button pulls a drop-down menu and the very first option on the list is "Game Settings". Clicking this option will open that game's Game Settings page. Some setting options are initially hidden from view for neatness sake on the Settings Page. Any Setting that has the ▼ icon in its name signals that you can click on it to roll out all the available options for that particular Setting. Clicking on it again will fold the setting options from view again. This option is only available to Plus and Pro subscribers. This setting called "Allow public access to this game?" is a Yes/No toggle. If enabled, anyone who views the game's Game Details Page can view any public journal entries (those with their permissions set to "All Players" in-game) from the Content on the Game Details Page. Any visitor to the Game Details page can also read the game's chat archive, as well as read and post on the Game forum. This Setting is disabled at default. This option is only available to Plus and Pro subscribers. 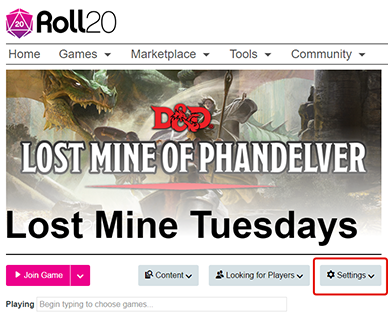 Roll20 offers a couple of backgrounds that you can add to your game's Details Page as well as your Looking for Group listing (should you choose to list it). At default, no background is chosen, but you can choose between Magic, Matrix, and Field backgrounds by clicking on the radio button under each option. All of the available background options are animated! If you hover your mouse over the thumbnails of the backgrounds, you can preview the animation. Only Pro subscribers have access to animated backgrounds. Plus subscribers will have a static image display of their chosen background. This setting enables or disables whether a player can export their character(s) from their Character Vault into your game. The Character Vault, which you can find under the Tools site menu, is a feature where players can store their character journal (including character sheet, if available) from any of the games they are currently in for safe keeping. Importing your character to the Character Vault is available to all account tiers. Exporting a character into a game requires either the player in question to be a paid subscriber (Plus or Pro tier) OR the game creator is a subscriber. In the latter case, export access is available to all players in the game regardless of tier level. The vault access for the current game is listed underneath the setting option for clarity. To make this easier to find, on 8/1/2017, we relocated this functionality to the Game Details page. The following options are Page and Token settings that will be pre-set whenever you create new Pages or Tokens in-game. If you have the game launched in another browser tab, you will need to refresh the tab running the game before any saved Setting Default changes will be seen. The way these Page Default Settings are ordered will look nearly identical to how the Page Settings window appears in-game. Every single option is available here with the exception of Play on Load, Delete Page, and Archive Page options. The Token Default Settings options are a mix of available settings from both the Basic and Advanced tab from the Token Settings window in-game. At the bottom of this section is a blue button labeled Save Defaults. This saves ONLY the changes made in this section. 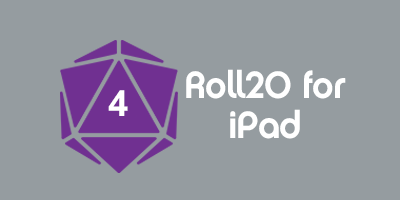 You can integrate one of the Roll20 OGL Compendiums into your game so that you and your players can look up rules while you play or to help with filling out character sheets. "Determined by Character Sheet (Default)" is what is set at default. If your game is using a character sheet template that links to a Compendium, the game will automatically choose that Compendium to include in your game. For instance, the "5th Edition ( OGL by Roll20)" character sheet template links to the "5th Edition" OGL Compendium. If you're running a game without a character sheet and wish to have a Compendium available in-game, you'll want to use the drop-down menu here to manually select the desired Compendium you want to use. You can share your purchased compendiums with players in your game. Details can be found in the Compendium Sharing section. This dropdown menu is the exact same one that is featured on the Game Creation page. You can change the desired character sheet template at any point and time via this option on the Game Settings page. Selecting the character sheet template from the dropdown menu and the sheet's features, author information, and a preview thumbnail image of the sheet displays below the dropdown menu when a sheet is selected. The following options are sheet settings that will be pre-set whenever you create a new character journal entry in-game. These settings are determined by the sheet's author. Sheet Type: This option sets the sheet default to either PC or NPC style. Roll Queries: When making d20 rolls, this setting dictates how the roll is output. The available options are Always Roll Advantage, Advantage Toggle, Query Advantage, and Never Roll Advantage. Always Roll Advantage will roll two d20s on every roll in case of Advantage or Disadvantage. The expectation is that if there is no Advantage or Disadvantage you use the left most result. Advantage Toggle adds three new buttons to the top of the sheet (this available for both PC and NPC modes) so that you can toggle advantage on a case by case basis. Query Advantage gives your a prompt every time a roll occurs. Before the roll is made, a prompt appears to ask if the roll is a Normal Roll (only one d20 is rolled), Advantage, or Disadvantage. Never Roll Advantage always rolls a single D20 on any given roll, expecting the player to roll a second time in case of Advantage or Disadvantage. Whisper Rolls to GM: This controls how rolls are listed in chat. The available options are Never Whisper Rolls, Query Whispers, and Always Whisper Rolls. Never Whisper Rolls makes every single roll from the character sheet a public roll in chat. Query Whispers will provide a prompt for the player when they roll from the character sheet. They're given the choice to roll openly in chat or whisper it to the GM (/gmroll). Always Whisper Rolls will whisper every single roll from the sheet to the GM (/gmroll). Auto Roll Damage: This option is a toggle between Don't Auto Roll Damage and Auto Roll Damage and Crit. If the sheet is set to "Don't Auto Roll Damage", rolling an attack from the sheet will only list the roll to hit. You will need to click on the roll template in chat to roll for damage. If "Auto Roll Damage and Crit" is selected, the damage roll is automatically included each time you roll an attach on the sheet. Add Character Name to Templates: This option is an On/Off toggle. When set to off, character names are not added to the roll template, and are only displayed as normal in the chat tab as the player/character selected as 'Speaking As'. Turning this option on takes the character's name on the sheet being rolled from and adds it to the roll template. This can be useful for players representing multiple characters. Inventory Type: This sheet has two different styles for tracking Inventory: A Simple and a Compendium Compatible (complex) one. The complex style is compatible with the 5th Edition OGL Compendium. This includes granular item amounts/weights, weight and encumbrance tracking, sorting, AC calculations, automatic attack generation, and more. The Simple option provides a text field for item lists for players who want more manual control over the sheet. Encumbrance: When turned On, the sheet uses the "variant encumbrance" rules on 176 of the Dungeons and Dragons Player's Handbook. When turned Off, the sheet disables the variant rules and only uses a basic over limit inventory weight check. Ammo Tracking: If turned on, the sheet tracks ammo automatically if the game is using the 5th Edition OGL by Roll20 Companion API Script (Pro Subscription Feature) in tandem with the Roll20 5th Edition OGL Sheet. Dungeons and Dragons Styling: Once a GM has purchased any of the available Wizards of the Coast products from the Roll20 Marketplace, they are given access to the official Dungeons and Dragons styled character sheet. This changes the existing 5E OGL by Roll20 character sheet and its rolling templates to take on the style, fonts, and graphics from the official Wizards of the Coast's Dungeons and Dragons 5th Edition character sheet. 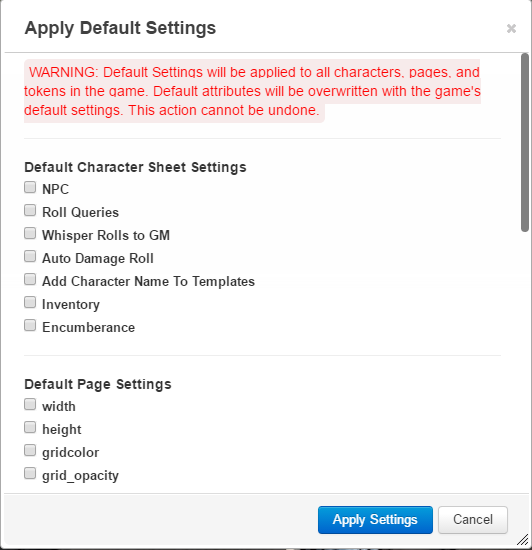 This setting allows the GM to enable or disable the Dungeons and Dragons styling on any game that is using this sheet. Once chosen and saved, the Sheet Styling setting change is automatically applied to every character entry in the game. At the very bottom of this page is a blue button labeled Save Changes. It is very important to click this button before leaving this page in order to apply any changes you made to the Game Settings. Character Sheet, Default Page, and Token Default Settings that you changed on the Game Settings page can be applied to existing content within a game. With the game launched on your browser, go to the Sidebar and click on the y icon to bring up the My Settings tab. Scroll down to the bottom of the tab until you find the Apply Default Settings button underneath the Experimental Features section. Clicking on this opens up a dialog box that's sectioned off by Page, Token, and Sheet settings. For each default setting you have changed on the My Settings Page, a checkbox will appear under its relevant category. Check each option you want to apply across the entirety of the game. When you're ready, click on the blue Apply Settings button. A confirmation alert will appear alerting you to how many Pages, Tokens, or Character Sheets will be altered. Click OK through the alert to begin the setting conversion. A process bar will appear at the top of the Apply Default Settings dialog box as Roll20 begins converting your existing tokens, pages, and character sheets to the desired changes. Depending on how many items are in your game, a settings conversion may take anywhere from a couple seconds to a couple minutes to complete. You can cancel out of the applying process at any time by hitting the ESC key. WARNING!!! Applying Settings will literally alter ALL characters, pages, and tokens you have in your game. Related attributes of these items will be overwritten with the settings you have checked off in this applier. This process can't be undone! If you found you've made a mistake or you wish to revert a change you've made with the applier, simply return back to the game's Game Settings Page and change the desired settings back. Relaunch the game and then run the settings applier again. If you have the Game Settings page open while you have the game launched in another browser tab, you must refresh the tab currently running the game in order for it to pick up any new saved changes to the Game Settings Page. This page was last modified on 28 June 2018, at 21:22. This page has been accessed 50,777 times.